Another day, another 3D printing partnership from BASF. This time the industrial chemical giant inked a deal with UK-based Photocentric to develop industrial 3D printing processes based on resin processes. Photocentric is one of the very few companies in the world that manufacture photopolymer resin, the feedstock used in every SLA-based 3D printer. Their resin products are typically relabeled by various other brands; if you’ve used a resin 3D printer, there’s a good chance you’ve actually been using Photocentric materials. But then, BASF is another producer of polymers, resins included. They are vastly larger than Photocentric, and have a catalog of polymer products similarly larger. How can two materials makers develop industrial 3D printing? Aha - BASF is working on the materials, while Photocentric is making the printers. Is this a switch for Photocentric, who made their fame through production of materials? Yes and no. We’ve previously seen attempts by Photocentric to produce desktop-sized SLA 3D printers, which, of course, used their resin. These machines were billed as demonstration machines to help develop sales of their main photopolymer products. However, the company produced several increasingly more sophisticated machines over the past couple of years. I always wondered how much success they would have marketing these machines, as they had to compete with countless other startups also marketing SLA-style 3D printers, some with very interesting features. But now things become a bit clearer; it seems these machines might have been to hone their skills at building 3D printers that could have led to the agreement with BASF. But the printers in question are by no means of the desktop persuasion. It seems that these machines’ designs are specifically based on a recent patent (US20180141268) assigned to Photocentric. 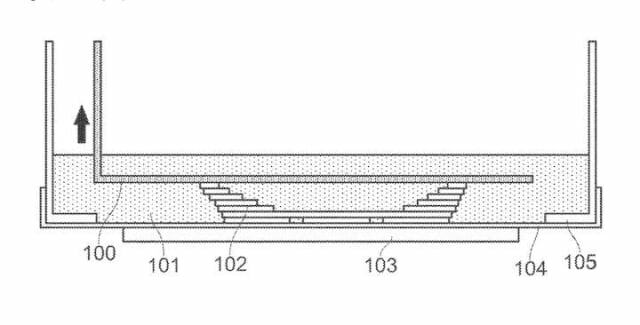 This patent describes a resin-based 3D printer that uses a common phone or TV monitor as the non-UV light engine, with a simple silicon coating to reduce sticking. (See image at top.) Interestingly, the patent specifically mentions the peculiar non-UV reacting resin being manufactured by BASF. Evidently the two companies have been working on this concept for some time.